If I had taken my tripod and the DISTO ™ D5 outside, I would have been able to tell him the angle of his roof as well as the total exterior area of the house needing painting. Those of you familiar with laser measuring devices probably won't be too surprised at the above, but a short time spent with the new Leica DISTO ™ D5 will persuade you that the D5 really does break new ground in laser measuring. And what is even better news is that the D5 is significantly cheaper than the DISTO A5 that it replaces. For this new technology and advancement it is very competitively priced for the time saving it will ensue. I guess this is made possible by the fact that the more we work with a technology, the cheaper it gets. Who would have thought that a half decent laptop would cost £300 in 2009 when we shelled out £1000 for something a quarter as good ten years ago? There is no question that Leica is a world leader in laser measurement with a range of laser devices to suit all pockets and applications - from the jobbing builder to the sophisticated surveyor. The DISTO ™ D5 just reinforces the dominance. For me, the most amazing feature of the D5 is the Digital Pointfinder. This is, in effect, a 2.4 inch colour digital screen with an aiming grid on it. With a 1x, 2x and 4x zoom it enables users to focus in on key measuring points over long distances (up to 200m with target plate) to achieve unprecedented accuracy using the Power Range laser. I have used a number of DISTO ™ models in a variety of applications over the years, but I was pleasantly surprised at how quickly I could become proficient in the new measuring features of the D5. This is due to the careful design and simple mathematical logic of the keypad - you don't have to have a degree in maths to make the D5 work for you. The clarity and readability of the calculator screen is another step forward. I was able to read it easily without my glasses, which is my acid test for clarity these days. But a word of advice - a good tripod is an absolute necessity to achieve accurate aim on the point of choice and the countdown timer stops any other human-induced wobbles. When it comes to build quality the D5 follows a long established Leica tradition. The laser lenses are all made of glass. This is hugely better than a plastic lens at allowing the laser point to reach the distances possible at the definition required. But I suppose glass can break, so Leica makes the whole DISTO ™ range with an alloy magnesium chassis under the ABS shell. This holds and protects the vital working bits. The outside shell of the D5 is ergonomically designed with plenty of grippy and protective rubber, not only making it good to handle but also splash and dust proof - Leica claims it is “Site Proof”. The D5 has a number of new functions apart from the “standard” ones like measuring distance, single Pythagoreanas measurements and area and volume calculations. With the clear design of the display and keypad, the new functions are very easy to use, as the D5 actually guides the user what to do next via the symbols on the display. Sounding more complicated than it really is to use, the trapezium function is used to find roof slopes and frontage areas. The DISTO ™ guides you to take the three measurements necessary and then calculates the result automatically. This mode, like the others, is selected from the symbolized keypad so there is no need to flick through the menus one after the other. 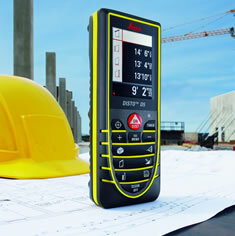 If you don't manage to make the right measurement, the DISTO ™ will tell you, with a clear error message. Embarrassing, but then only the user should know about it. Related to this mode, selected by two pushes on the button, brings the tilt sensor into play. This allows the DISTO ™ to calculate roof slopes when access is limited to taking only two measurements. The tilt measurement is so sensitive that resting the D5 on the actual slope or using a tripod is vital. Lastly, the DISTO ™ will easily measure horizontal distance, even when there is a wall or hedge in the way, by simply allowing another tilt angled measurement to be taken and then calculating the right angle. A save button will store all the readings from a session ready for referral later. And for complicated room shapes, the user simply divides the room into triangles and measures and the DISTO ™ will accumulate the measurements to calculate area or volume. When buying new kit we all tend to do the cost benefit analysis, even if, like me, we were thinking we might buy it because we deserved it. An estate agent armed with a bottom-of-the-range DISTO ™ D2 will save significant amounts of time measuring up a property and will therefore very quickly make up the cost of the tool. A more sophisticated DISTO ™ will cost more but save proportionately more time. All the other measuring equipment is made redundant too, so expensive long tape measures are no longer required. Gone too is the assistant to hold the ladder or climb to the top of a roof pitch clutching the end of the tape measure. Also disappeared is the risky business of clambering over walls, roofs or a building site in order to get an accurate measurement. So the final analysis is really a no-brainer in terms of cost, health and safety and even Green grounds. I own a DISTO ™, and the number of times people borrow it from me is an indication that once you know how easy laser measurement can be, the DISTO ™ solution is the obvious choice.